Find comfort, convenience, and efficiency with a tankless water heater. You’ll never run out of hot water again with an endless supply of hot water for any size home, wherever and whenever you need it. Tankless water heaters (also known as demand-type or instantaneous water heaters) heat water directly as it flows through the system. When the hot water tap is turned on, water travels into the unit where a gas or electric element heats the water. You turn off the tap, the water is not heated – there is no storage tank*, as with a traditional water heater. * Newer tankless models utilize a 0.5 gallon buffer tank to eliminate the lull when you first turn on the hot water. Compare this to a 40-50+ gallon tank in the average conventional water heater. Conventional water heaters are essentially a storage tank for hot water and, with continuous use, will run out of hot water as the demand empties the tank. Hot water is then unavailable until the cold water entering the tank has heated, taking 1-2 minutes per gallon of water in the tank to reheat completely. We all know how this works…one person showers first, and the second person gets hit with cold water half-way through! A tankless water heater will provide you with exceptional reliability and ease of maintenance, while also making sure that you never run out of hot water at home. Let’s look at some of the benefits why homeowners choose to make the switch to tankless water heaters. Wall units are about the size of a suitcase! Reduce your energy usage by up to 40%, heating only what you need and providing it on demand. Tankless water heaters avoid the standby heat losses associated with storage water heaters. That’s the energy wasted on keeping a large tank full of hot water at all times. Tankless water heaters that use an electronic ignition do not require a standing pilot light. Efficiency in technology helps to conserve natural resources, including water. Tankless units produce less carbon dioxide and nitrous oxide emissions. Tankless water heaters are constructed from recyclable materials, with easily replaceable parts. Tankless systems may qualify you for energy efficiency rebates and increase the value of your home. 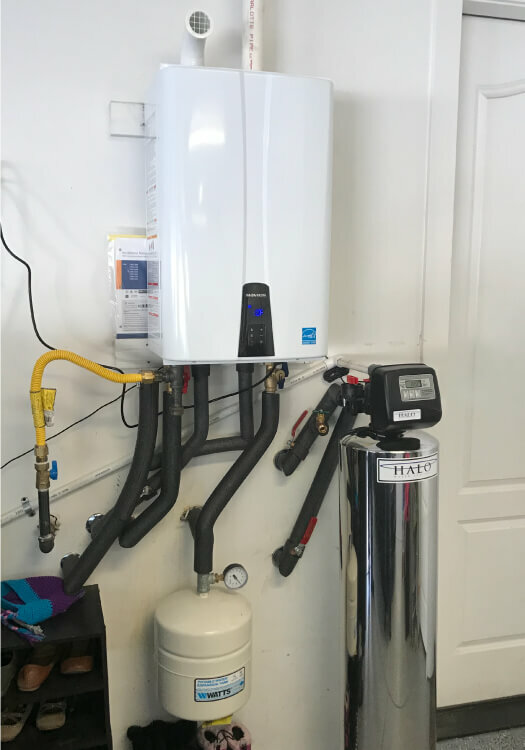 The space-saving design of a tankless water heater pairs well with the installation of a whole-home water filtration system; together they take up less space as the old tank-style water heater. While the initial cost of a tankless water heater is greater than that of a conventional storage water heater, tankless water heaters typically last longer and have lower operating and energy costs, offsetting its higher purchase price. Most tankless water heaters have a life expectancy of more than 20 years, with easily replaceable parts that extend their life by many more years. In contrast, storage water heaters last 8–12 years. New advances in technology allow multiple faucets to draw hot water at the same time without affecting the flow rate. So, rest assured, a tankless heater can produce enough hot water to accommodate your family’s needs. Ah, yes, you’ve heard of this dreaded scenario which occurs when the tankless heater shuts off as you close the faucet; you turn the faucet back on and you’ll feel that cold water flowing past the tankless heater before it’s triggered to heating the water flow once again. Technology has answered this issue, and the newer tankless models have a 0.5 gallon buffer tank that eliminates any delay when you require hot water. Tankless water heaters will work with most existing water and recirculation systems in your home. A recirculation pump circulates water throughout your home, reducing the wait for hot water regardless of the faucet that demands it. This minimizes the waste of cold and warm water down the drain while you wait for hot water to arrive, thus saving resources and money on your water bill. If you are not currently using a recirculation pump in your home, consider a Navien tankless water heater with the pump integrated within. Your Plumber is pleased to provide product sales, installation, and service for the two leading tankless water heaters in the United States. Contact us to learn more and determine the best option that suits you and your family.